Before using a new technology tool, every organization should lay out a testing plan. This may seem like an obvious first step, but not testing, or testing under the wrong conditions, can have a negative impact on the effectiveness of the tool. When that tool is part of a safety and communication plan, testing and ensuring its effectiveness become all the more important. Emergency notification systems have many moving parts that need to be in sync. Since these solutions can connect to multiple devices, it’s important that messages get sent to the right places, at the right volume, and in the right format. That may require a little trial and error to get everything running the way an organization wants it. 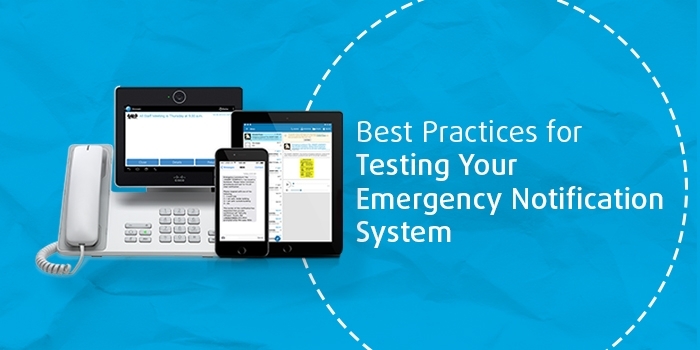 In this blog post, we outline the steps every organization should take to effectively test their emergency notification system. When developing a test plan, it’s important to document the testing process. Emergency notification systems leverage different message formats and devices to reach as many people as possible. Knowing what situations need to be tested for, what devices need to be included in the test, and who will take part in the test are all factors that need to be determined before testing begins. Each scenario an organization is trying to prepare for may require a different testing method. Conducting a hyper-localized test rarely gives organizations the insights they need about what is and isn’t working with their system. Keep a record of who the testing team is, what situations they test for, and the devices included in the test. Develop guidelines for what language test messages should include and the best times for conducting tests. This may be before or after normal business hours, or, for a school, it may be best to test during summer or holiday breaks. For many organizations, leveraging phones may be the primary method for sending emergency notifications. Ideally, an organization uses every communication channel available to maximize the speed and reach an emergency message goes out. Testing should follow the same principle. Just because a message tests successfully to a desk or mobile phone, doesn’t mean it will reach every device an organization wants. By that same token, just because a message is sent successfully as a phone call, doesn’t mean other formats will also work as intended. Testing every message channel and format helps ensure that information is communicated clearly and reaches every person and device an organization wishes to reach. For live drills, you may want to use language that would be communicated if that situation took place, but it is still a good idea to preface those messages with language that makes it clear a test is taking place. Once initial testing is completed, and the emergency notification system is running the way it is intended, it’s important to develop a regular testing schedule. New systems may need to be integrated, and people may need to be added to recipient lists. Conducting regular tests helps ensure the effectiveness of the system, and that messages are reaching the right people and devices. One simple way to do this is by scheduling messages for daily functions, like shift changes or school bells. This is a safe way to test an emergency notification system without calling it out as a test, or needing to worry about people misinterpreting the message.